The Stormwater Management rules, N.J.A.C. 7:8 specify stormwater management standards that are mandatory for new major development. The New Jersey Stormwater Best Management Practices Manual (BMP manual) is developed to provide guidance to address the standards in the proposed Stormwater Management Rules, N.J.A.C. 7:8. The BMP manual provides examples of ways to meet the standards contained in the rule. The methods referenced in the BMP manual are one way of achieving the standards. An applicant is welcome to demonstrate that other proposed management practices will also achieve the standards established in the rules. The BMP Manual is a developed by the New Jersey Department of Environmental Protection, in coordination with the New Jersey Department of Agriculture, the New Jersey Department of Community Affairs, the New Jersey Department of Transportation, municipal engineers, county engineers, consulting firms, contractors, and environmental organizations. 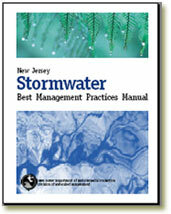 1) For more information on the NJDEP Stormwater Program and the BMP manual, please click here. 2) NJ Stormwater – Construction Activities (5G3) and RFA Permit Information Page: click here. 3) The NJDEP has created a helpful guidance manual for implantation of the 5G3 permit entitled “Stormwater Construction Permitting Best Management Practices Guide” It is available here: Stormwater Best Management Practices Guide.